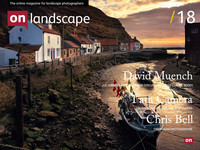 David Muench is one of the first great colour landscape photographers. With a huge back catalogue of publications, he has influenced a generation of photographers and has created many of the places americans now call icons. Tim Parkin and Joe Cornish go through the book "Nature's America" discussing it's influence on Joe and the assets of the photographic skills shown inside. We hope you enjoy (apologies for the video quality - hopefully it's good enough for the purpose.